לצערי הרב, מעטות מאד רשומות היורוליג שניתן למצוא בבלוג בגלל המחסור בוידואים של מהלכים ספציפיים. מובן מאליו שניתן ללמוד הרבה יותר על אימון כדורסל מצפייה ביורוליג מאשר מצפייה במשחק NBA מכיוון שהקבוצות האירופאיות מתאמנות לעיתים קרובות יותר ושמות דגש רב יותר על העבודה על המשחק הקבוצתי. התרגילים של הקבוצות האירופאיות בדרך כלל מורכבים יותר (מאמן NBA שיוצא לעונה של 82 משחקים לא באמת מצפה מתרגילים שלו להביא לסל קל פעם אחר פעם) והחשיבות של הגבוהים הרבה יותר גדולה. שחקנים מס' 2 ו3' הולכים בדרכים שונות, שחקן מס' 2 הוא הראשון שיוצא החוצה אך חותך מהר פנימה כדי לחסום חסימת פלקס לשחקן מס' 5. שחקן 3 יוצא החוצה לקבל את הכדור ומחפש את שחקן 5 עם המיסמץ' מתחת לסל. Coach Avery Johnson has quickly made himself known as a head NBA coach. His aggressive, fast-paced style as a player is mirrored in his coaching style also. The topic of attacking defense is presented in a unique manner. The first part of this presentation is attacking Man-to-Man defense from a defensive standpoint. Johnson lists several benefits for this style of play: It will disrupt the timing of your opponent's offense, it wears out the opponent and it turns up aggressiveness. Johnson also acknowledges there are disadvantages to attacking also. This defense can be vulnerable to transition baskets by the opponent. Picking up the ball, covering the basket, and getting to "threats" put pressure on defensive transition. After a made basket, Johnson shows some opportunities to jam the in-bound passer and slow down the possession. 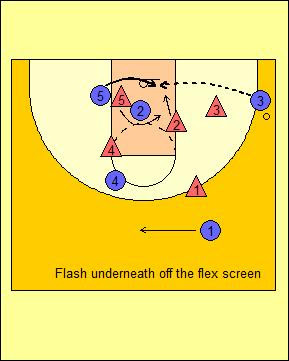 This defense philosophy looks to trap near the half court area and rotate with interceptors to force turnovers. This attack can be done at the full-court, _ court, or half court. In the half court, specific techniques and strategies are demonstrated and explained. Building a wall against penetration is crucial for good defensive teams. Once trapped, this defense makes it hard for the offense to pass. In Part II, Coach Johnson looks at attacking Man-to-Man defense from an offensive perspective. 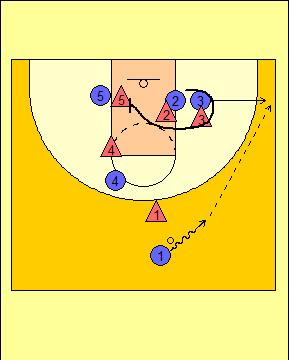 Transition basketball is a great way to put pressure on the defense. Once the ball is in the hands of the point guard, the goal is to push the ball hard as teammates run the floor. The options now presented are the pick & roll, post feed or screen and shoot. Against trapping and back court pressure, the offense must "square the floor up." Other concepts in the half court include pressure releases, spacing the floor and realizing mismatches. The pick & roll is a weapon and Coach Johnson shows the side and middle pick & roll technique.